Patient D was in middle of a four day pain attack in his upper right shoulder blade when we came into my office. He had experienced pain like this before, but not to this degree of severity. The pain was in his upper back, just to the middle of of his scapulae bone, below the trapezius muscle. It radiated pain up into his neck. He experienced a lot of pain trying to rotate his head to look to the right. His mobility to the right was very limited. Patient D’s story is important to anyone who deals with chronic pain between the tip of the shoulder blade to the top of the shoulder.Why? Because D’s story reveals why people with this sort of chronic pain – especially those that have to use their arms constantly (dental hygienists, hair stylists, painters, etc.) – often can’t find help…Until the neck is expertly corrected. 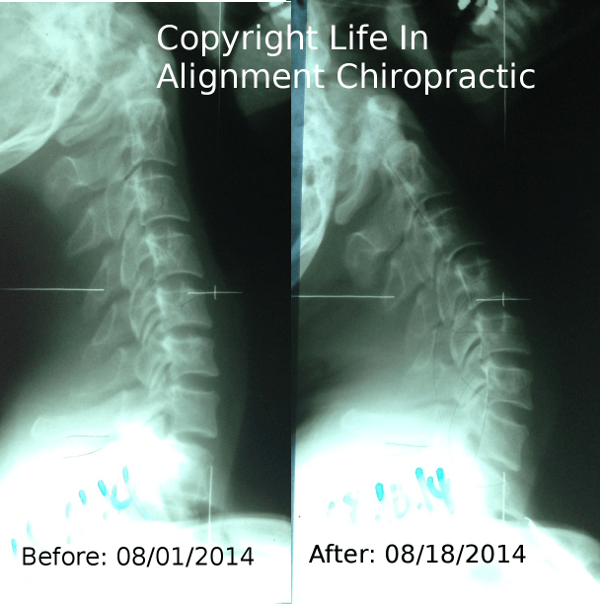 Before his neck correction, this patient could not full look up, reducing the health of his joints. He could barely move his head back to look at the ceiling. He experienced at least one minor headache on a weekly basis, with occasional mid- back pain. In his past, Patient D had several hockey injuries, multiple concussions, and at least one car accident where he was rear ended. Based on his posture, and his x-rays, Patient D’s neck was unlocked using several specific and gentle movements of my hands with the patient laying on his side. The protocol used for this patient is called QSM3. Patient D left after his first correction process still in pain. Even after resting for 20 minutes after his first correction he still hurt. While this wasn’t ideal from Patient D’s perspective, I knew that any lasting relief would probably only come after his lower neck started shifting. 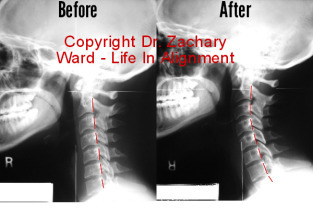 As it turns out, Patient D had a very extreme response to his first correction, as his neck began to unlock out of the reverse cervical curve almost immediately. What happens when the injured neck moves very quickly? Patient D experienced a few hours of temporary relief followed by 36 hours of pain and exhaustion. He literally stayed in bed for an entire day, he was so tired from the changes taking place in his spine. Two days after his first correction process, he regained some energy and finally saw a drop in his resting shoulder pain. From that point on the extreme pain near his shoulder blade would gradually decline and disappear over the next four weeks. Occasional flare-ups would only happen after Patient D started playing hockey again, and took a few hits into the board from an aggressive player. I can’t say conclusively that Patient D avoided a future of poor health because his neck shifted. But we can speak in probabilities. Reverse curves in the neck are associated with a number of health problems. And since Patient D’s neck shifted after being unlocked – it’s definitely probable that he’s going to avoid a future of annoying to debilitating symptoms just so long as his neck stays healthy. He may also be more resilient to injury with his neck in a healthier alignment. Do you have a question about this case, or another? Please call the office, or use the contact box on this website to ask.